Shakespeare’s final play The Tempest – a rich mixture of comedy, tragedy, fantasy and romance (in short a microcosm of his 36 other plays combined) – received a colorful, multimedia staging by The Old Globe and LA Phil in the Disney Hall, its shiny, billowing ‘sails’ and boat-shaped auditorium providing an ideal venue for the nautical-themed play. The sets were basic and effective: a long wooden plank in the shape of a ship stretching across the stage, separating the orchestra in the rear and the players in the front. A large video projection screen draped over the stage, showing ‘psychological’ images of the characters and their actions. Long dark shadows of stage props flashed across the screen during the opening storm scene; Ariel transformed into a giant black bird in Act II banquet scene; rich floral images accompanied the magical nuptial scene. Video projections seem to be taking over physical sets in opera houses and concert halls these days, but when done with taste and sensitivity as they were here, the results can be mesmerizing. 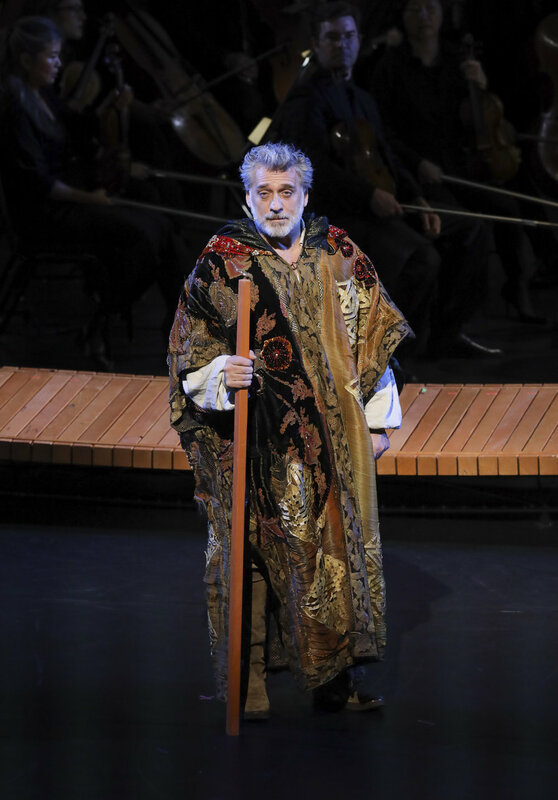 The Old Globe troupe – directed by Barry Edelstein and donning Judith Dolan’s fanciful period costumes – delivered a powerful, often affecting, performance, led by Lior Ashkenazi as magician Prospero and Audrey Corsa as his daughter Miranda (potentially a precursor to Verdi’s Rigoletto-Gilda). Beth Malone’s Ariel was a blithe fairy flying through air like Peter Pan with the aid of a team of dancers clad in black. The three comedians – delightfully portrayed by Peter MacNicol (Stephano), Kevin Cahoon (Trinculo) and Tom McGowan (Caliban) – are direct descendants of Shakespeare’s Puck and Bottom, who in turn can be traced to the Italian Commedia dell’arte. The rest of the cast all gave sharply focused and nuanced readings, hampered occasionally by the over-amplified sound (always a problem when teaming with a live orchestra) that blurred their words. Content to serve as the soundtrack to Shakespeare’s play, Sibelius wrote “The Tempest” incidental music with no great ambitions other than to provide moods and character motifs to the story. While not on the same level as Mendelssohn’s music for “The Midsummer Night’s Dream”, Sibelius’ music is full of vivid and rich tone paintings, even onomatopoeic in some cases (supplied by the versatile LA Master Chorale): string pizzicato and harp for Miranda’s sleep; heaving, syncopated bass for the disfigured monster Caliban. Conductor Susanna Mälkki led the LA Phil in a highly atmospheric and colorful performance that was all too often rendered inaudible by the crudely amplified spoken words. A fine group of singers ‘dubbed’ the songs for Ariel (mezzo-soprano Elizabeth DeShong), Juno (soprano Ying Fang), Caliban (baritone Timothy Mix), Stephano (baritone Jarrett Ott) and Trinculo (tenor Joshua Wheeker). 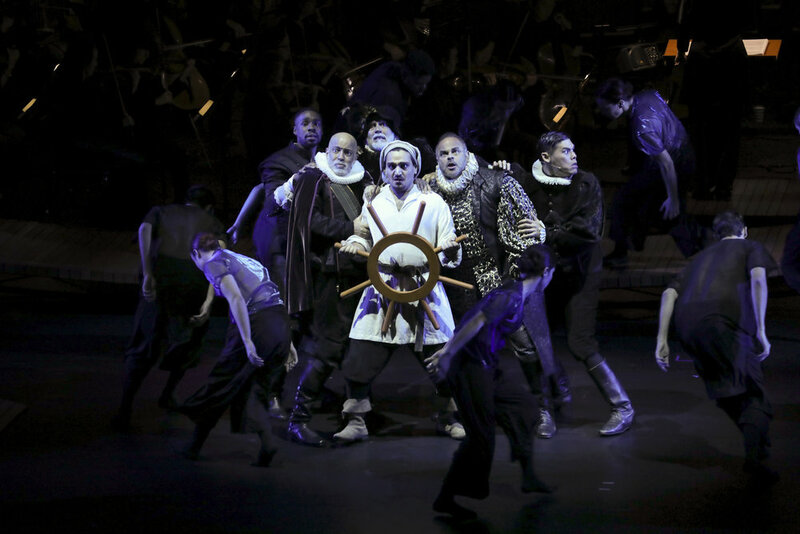 Rounding out this enjoyable evening of multimedia Shakespeare were the dancers, ten strong, whose grace and buoyancy added a crucial fantasy element to this masterful production.